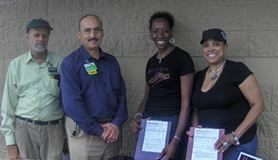 Sugar & Spice members Ara Watkins and Natalie Johnson held a voter registration drive on Saturday, September 29, 2012 at a neighborhood Wal-Mart in Houston, TX. The ladies registered approximately 50 nonvoters and distributed another 60 registrations forms to individuals who wanted to take one to family and friends. Information was also given in regards to voter registration requirements in Texas, including the type of voters need to participate in the 2012 election. In partnership with Excel Star, Inc., a New Orleans youth organization, Sugar & Spice sponsored a group of children to attend their First Annual Youth Fest in Breckenridge, Colorado on November 17-20, 2012. The Youth Fest was born out of Sugar & Spice’s commitment to introduce, encourage, and promote skiing and winter sports. Through avid fundraising and networking, transportation, lodging, and professional ski/snowboard lessons were provided. Having never been to a mountain or seen snow before, these children were excited and eager to learn about winter sports. The youth participated in several other winter activities such as: ice skating, snowboarding, and sledding. This weekend was a success as EVERYONE was reluctant to leave.